Hollywood actress Sigourney Weaver seems to know a thing or two about video games – or at least she has no instant allergic reaction to them because they are “too violent”. She would also love to do some voice acting in a few games based on movies she starred in, especially Ghostbusters if it was a “quality title” and not Aliens because the game does not stay true to the Ripley character. And if you’re wondering what “Aliens” game is Sigourney Weaver talking about, the truth is that nobody but her and probably the game developers know – and we might be talking about a brand new, unannounced yet Aliens game! Neither Obsidian nor Gearbox have made a game called “Rednecks” and Sega denied to MTV that Sigourney Weaver was talking about them. Actually, the only “Rednecks” game we know of is Redneck Rampage but game’s developers Xatrix Entertainment no longer exist. However, the company was acquired by Activision in 2002 and worked on other FPS titles as well. 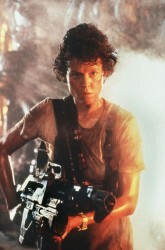 So… was Sigourney Weaver referring to Activision working on an Aliens game? Now putting this mystery aside, it’s worth noting that the actress said she would like to be involved in the upcoming Ghostbusters game, but only if it’s a high quality title. We saw that the game looks awesome and it will definitely be a quality title, but there’s still one problem left: Mrs Weaver was not even asked to be a part of the game!